Time flies by. It feels like I started this blog yesterday. Yet, next April, it will be nine years ago that I started to write some random thoughts without any much other purpose that put them in writing. I had not thought that what was coming next would be as successful as it has been. So let’s review quickly a bit what has happened in the past nine years and where it will head in the future. First, it is good to remember that nine years ago the world was experiencing a major economic crisis and commodity prices were at their high. As a result many people were concerned that agriculture would not be able to adjust production to meet future demand. The topic of the future of food and agriculture was rather hot. For this reason, interest for my articles was growing as I was posting more of them. This led me to expand and compile my material. 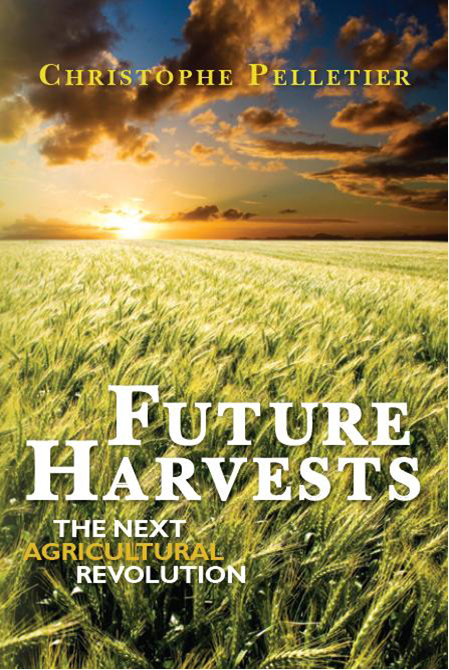 My first book, Future Harvests, was born and published. To my surprise, the book sales exceeding my expectations and my name started to circulate. Customers started to come to me. It is remarkable in a way that I never had to prospect for customers. The interest for the topic and for my work led me to publish my second book, We Will Reap What We Sow. The rather modest blog has delivered. I did many presentations and participated to many conferences internationally. I have been interviewed many times by both mainstream media as specialized media from a number of countries. My articles and books seem to have found their ways in high schools and university in many countries, too. Customers came to me to have my views on what is coming and appreciated my approach. The outcome has been very positive. Personally, beyond the assignments, I am quite happy to see that my predictions have been accurate and that I could see future developments earlier than others. This is why and how I truly add value to my customers. This sense of anticipation is a complete part of who I am. It has always been. I have no idea where this intuition and sort of sixth sense comes from but it is there and quite real. On the other side of these positives, I have to admit that I am a little disappointed, in a relative manner though. If I can be proud to be ahead of the pack and see things earlier than most people, it also means that they do not anticipate the changes and the opportunities to come as well as they should and could. I find this worrying especially in the case of large organizations, be it corporations, governments or NGOs, because considering the resources that they have, I should be irrelevant and the one to be left behind. On my FAQ page I give a couple of examples about the FAO, but I could make a much longer list of similar cases. Believe you me, if I had their resources, I would be a rocket launcher. Another source of disappointment, although not to common fortunately, has been those who clearly felt threatened by the knowledge I was sharing with their organizations. It was truly amazing to see that particular global corporate senior executive, in charge of group of almost 100 strategists from all over the world, monopolizing the microphone for an endless attempt to show he knew more than I did anyway. I don’t know if he did and I don’t care but it was an awkward situation and quite a few of his employees were exchange looks with me showing the same kind of awkwardness I was experiencing. There have been other occurrences of people who simply do not want to have an open mind because they have difficulties with disruptive change coming their way. They can cling to the present but they won’t last. Pity because all the predictions I presented them have now materialized. As I said, such negative experiences have been rare and I never quite understand why any organization would want to hire someone like me if all I could tell was stuff they already know. Where would be my added value then? They should have been happy that I was presenting them a new vision of the future and should welcome the opportunities that they offer. Change happens everywhere and for everyone. That is true for me, too. This is why the time has come for me to rethink my role as The Food Futurist. For how accurate my predictions may have been, as time goes by, more and more people have become aware of things to come. I do not see the point for me to keep on telling the same stories over and over again. The added value fades over time and I do not like to be in the herd. The first change that I want to implement is a shift from the likely future towards the desirable future. So far, I have been focusing more on the rational and factual aspects of the future and the changes happening. This more analytical approach is somehow easier in the sense that people are, believe it or not, rather predictable. History tends to repeat itself. By shifting to the desirable future, I will be able to bring more of my own vision and in particular pinpoint the absurdities of our current systems and why keeping on doing more of the same, although in a slightly different packaging, will result in the same results. Bringing in my personal opinion instead of rationalizing the dynamics of change will also allow me to focus more on philosophical, and possibly, political aspects of the future. It is my strong conviction that when it comes to the future of food and agriculture, there is a strong imbalance between the technological aspects and the human aspects, the latter being gravely neglected and if we do not change our attitude about this, there will be negative consequences. The future of humankind is really about humans. Unfortunately, we do not think enough about the future in human terms. I will explore this further. Forecasting the future of technology is easy. What everyone talks about nowadays is what I have talked about years before. Only those who sleep haven’t read or heard about all the tech possibilities. Time for me to go beyond what everyone can find online easily. I won’t add value to you and to myself by settling in the herd and talking about same stuff as dozens others do. Anyone with half a brain can do a Google search and write a book about future technologies. There is all you can find. There is the realistic and the fantasy just as well. What does it matter, since the future is later? Technologies that will not deliver will be forgotten and for technologies that deliver results, it will be easy to say “told you so”. My goal will be to develop a vision that is centered on human prosperity and happiness. It must be clear that I do not intend to neglect new technologies because future tech developments will affect our lives. Instead of looking at the future from a futuristic point of view, I will do that from a quality of life point of view and look at the practical consequences of change, even more so than I have done so far. I wish to engage in a reflection process more than simply play futurist/consultant because the latter too easy and the former hardly anyone really does. I like to be ahead and I like to be different. In the future, I might talk less about food and agriculture specifically and more about big picture and connecting the dots between food and agriculture and all the other dimensions. My philosophy in life and in business is simple. Everything I do, I do not do for my personal glory. I could care less about that. What I do is for you, for my customers and help others expand their horizons and think more. The thinking part is becoming more and more of a necessity, especially in a world where everything seems to be aimed at distracting people from thinking too much (having a brain and using might be subversive you know) or simply inhibiting them from thinking thanks to political correctness which is no different in its purpose and functioning as a thought police and insidious form of dictatorship. For the future of this blog and of my work, there will be more love and more tough love. I will be more direct and outspoken. I will challenge leaders, because they really need to be challenged. I won’t do this in an aggressive manner but I will pinpoint the weaknesses and demand higher standards. The “me here and now” leads only to disaster. I will bring more of “the others somewhere else and later as well”. Copyright 2018 Christophe Pelletier – The Happy Future Group Consulting Ltd. This entry was posted on Monday, March 26th, 2018 at 3:59 pm and is filed under My Job, Policies & Politics, Uncategorized. You can follow any responses to this entry through the RSS 2.0 feed. Both comments and pings are currently closed.